This versatile table is ideal as a point of care surface on an IV pole, headwall rail or medsurg rail. 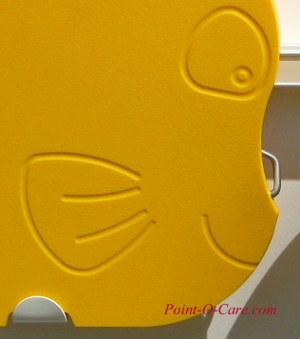 Simply flip the surface down for use and slide out of the way when finished. Components are strong and durable - polypropylene table surface, stainless steel hanger, and powder coated steel clamps and slides. All materials will withstand standard disinfection methods. These tables are the perfect size for a mayo tray, tablet PC, phlebotomy tray, folder, bin or basket. The surface is 15" x 12". 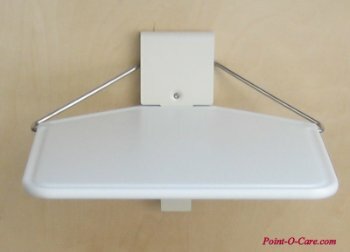 You can couple the IV pole work surface with our Accessory Block and accessories to create a complete pole-mounted point of care workstation. The intuitive locking system locks the surface in the stored position to prevent movement and noise while the pole is transported. 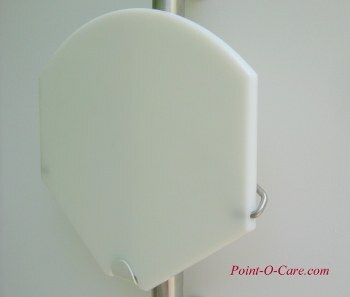 The IV pole clamp fits poles from 1" to 2" in diameter and features an ergonomic knob for easy grip and tightening. 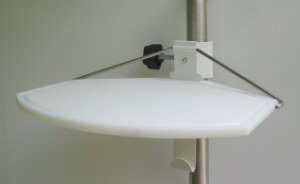 The MedSurg and Patient Care Table can be adapted to mount to all types of equipment. Contact Us to discuss your unique situation. Pediatric Wildlife Care Tables, counter-balanced for ease of use, allow professionals to position workstations where they are needed most. Quickly attaching to existing head walls, vertical equipment columns and IV poles, Care Tables make the most efficient use of limited bedside space. 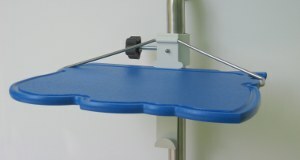 Indispensable in Med-Surg, exam, and patient rooms, these cost-effective care tables measure 15" wide x 12" deep, a perfect fit for a tablet PC, phlebotomy tray, folder, bin or basket. 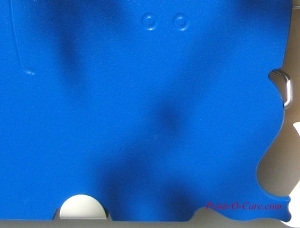 While invaluable from a clinical standpoint, the plastic tables are designed in brightly colored primary colors and shapes for added appeal to younger patients. 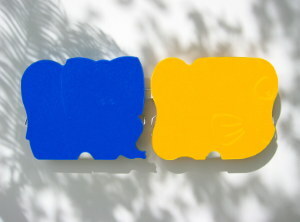 The Yellow Fish and Blue Elephant are standard, with custom shapes available to complement unique architectural concepts. In rooms, halls, conference areas or anywhere space is at a premium this flip-out table will become indispensable. 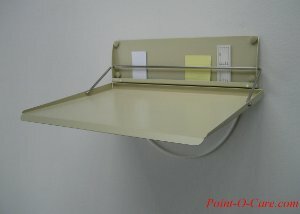 The handy table is lowered when needed and flipped out of the way when not in use. The generous 19" x 14" table is perfect for positioning phlebotomy and first aid supplies while caring for patients. It's fantastic for charting too. Hugs the wall for out-of-the-way convenience. With a clearance is only 1-1/8" its great for hallways and other high traffic areas where a table is handy but dangerous to leave laying around. It's a table where you need it when you need it and out of the way when you don't. All components can be cleaned by all standard methods. 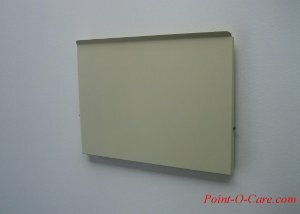 Only four screws need to be anchored into your wall for installation.